The city of Desoto is a suburb of Dallas, part of the Best Southwest area. 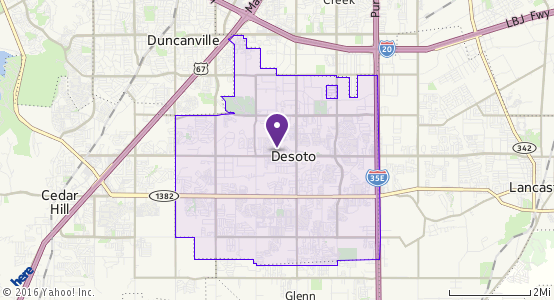 With a population of 49,000, Desoto is made up of a unique and very diverse community. The city offers more than 22 different dining experiences and an array of shops for the whole family. Desoto is nestled within the rolling hills and trees of Southwestern Dallas County among attractive housing, welcoming neighbors, fantastic schools and 12 newly updated parks. For those who love to adventure and be active you can do so right within your own city. Desoto offers an outdoor pool, a senior and rec center, a civic center, trails for biking and hiking as well as a BMX track. Not only do all of these fantastic amenities set them apart, but the city of Desoto also prides itself on the annual events that they organize. With activities such as, the Easter Eggstravaganza, a fishing tournament for kids, the Parade of Lights, and a Latino Heritage Festival, there is sure to be an opportunity for everyone to embrace the community. Desoto ISD is made up of 9,800 students spread across 12 exceptional campuses. DISD is a small suburban district 15 miles south of Dallas that prides itself on structuring schools to be academically excellent by design. Desoto ISD met the states standards, and received superior and platinum rating. To learn more about the favorable city of Desoto, explore the links below.